It’s taken me a while… decades…! to reach equanimity towards the alleged festive season. Under pressure to devise something seasonal for the first Cirencester Christmas Poetry Slam, I wrote the following doggerel – and it got me through to the competition’s second round! Being within a gnat’s whisker of slam virginity, I was ridiculously pleased. Throw another peasant on the fire! Gifts I’ll buy myself: things I like! Celebrating Christmas on my own. Libraries are important. I only survived a lonely and often unpleasant childhood because I could escape into library books. Gloucestershire County Council plans to cut library services by 43%. They want to stop running 11 out of 26 libraries; they want my local library at Bourton on the Water to become a so-called ‘self service’ library opening only three hours a week; and they want to do it all NOW. I need libraries partly to research material for my performances, and partly for leisure reading. The proposed cut at Bourton is especially stupid because it will make library books and other services inaccessible for people without cars. Among the shut out will be Bourton’s many older residents and parents with young children. You try waiting for one of our rare rural buses in the freezing cold/rain with a pack of toddlers, or even if you’ve just got a bad back..! Libraries cost only 1.46% of the total Gloucestershire budget, yet they’re expected to accept 2.3% of the total cuts. Specialist jobs are apparently to be replaced by unpaid, untrained volunteers. Gloucestershire’s mobile libraries and the housebound library service will be wiped out. Once these services are gone and libraries closed, we’ll never get them back. There’s still just enough time to sign the anti cuts petition, either online at http://www.foclibrary.wordpress.com or you’ll find petitions to sign in lots of local shops and businesses – all to be returned by 31 December, please! You can only sign the petition if you can give a GL postcode ie if you live, work or study in Gloucestershire. 5,000 signatures will oblige GCC to formally review their proposals. More than 3,000 have been collected in three weeks. I’m supporting Friends of Gloucestershire Libraries because I want Gloucestershire County Council to change their plans for library service cuts. Certainly libraries must share in the county’s economy plans – but reductions must be fairer and less destructive. Current proposals were put together based on an earlier consultation with fewer than 1% of Gloucestershire residents. 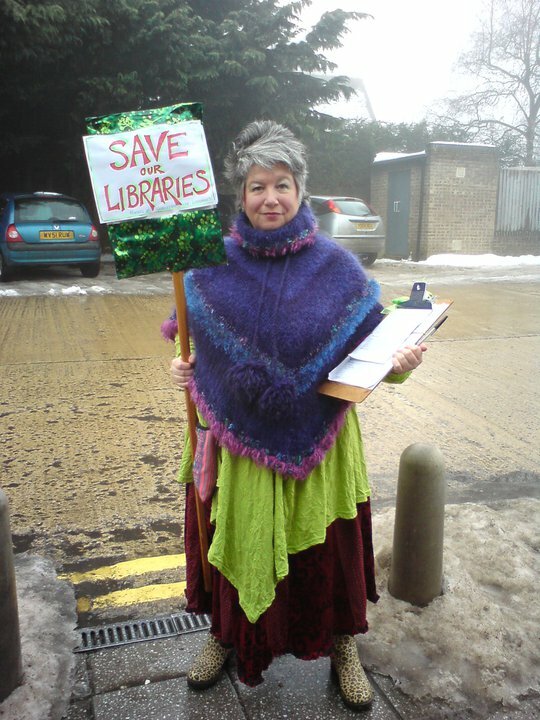 At lunchtime I glammed up as best I could for the Gloucestershire Echo photographer’s snap of me and my protest banner in the snow at Bourton Library. Then I lurked outside local shops for couple of hours collecting 50 more signatures for the libraries petition. It was cold and wet, and not much better at home with no radiators and no LPG delivery date. But I grew up without central heating – was a toddler in ’63, y’know! – so what’s a bit of cold compared to the chilling prospect of a whole generation effectively denied a public library service. And we’ll still all be paying for it in Council Tax!
! Subject to sudden changes!